One of the best Cydia tweak, QuickShoot Pro was launched recently that enables you to speedily capture images or video clips by setting up Activator activities or by double tapping the built-in camera application’s icon to capture a picture or triple tapping the camera icon for video capture. If you have ever skipped out on a precious moment because you were too slow taking an image or capturing a video, then you must have this tweak. Once you install the QuickShoot Pro tweak from Cydia, it will be enabled by default and you can test it out by double tapping the default camera application’s icon. An animation will be displayed within the camera application's icon to signal that the photo capture is occurring and has completed. The captured image will be taken and stored to your photo application camera roll area instantly, without having to launch the Camera application. When the camera app is triple tapped, the iPhone will immediately start capturing video. The camera icon will display a blinking red "recording" indicator until the icon is triple tapped to cease recording. Whether you are capturing images or videos, the front or rear camera will be used based on the option you choose in the default Setting application. 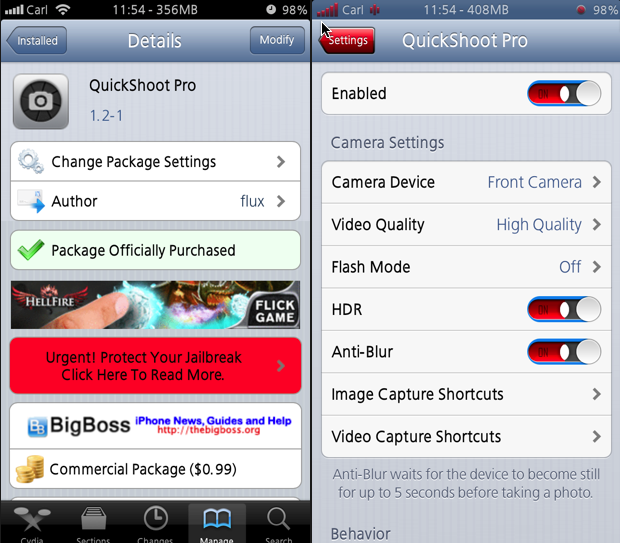 There is no application icon for QuickShoot Pro because it is a tweak; not an application. The QuickShoot Pro Cydia tweak has a few configuration option that you can set up from the Settings application that contains the capability to activate the front side or rear camera, you can adjust the video quality, turn flash on or off, enable HDR, enable Anti-Blur or set Image and Video capture shortcuts. If you do not like the standard double tap to capture a picture in a fast way, then you can choose another Activator method to take images and additionally another Activator activity for capturing video. Then you can also set an Activator action to bring up a fast options window anywhere in iOS that enables you to quickly toggle the HDR, Flash and camera choice. You can also assign any other application icon to the dual tap functions: double tap to take a picture and triple tap to capture video. So you can make the Safari, Weather or any other icon perform these same functions. One nice feature is while video and audio is being captured from either camera, you can put the iPhone to sleep (turn screen off by tapping the power button) and the video will continue to be captured. The video will record regardless of whether the phone is locked with a passcode or not. Wake up the iPhone or unlock the screen and double tap the icon used to start recording to end it. Remember you can tell which icon is recording because of the blinking red "recording" light on the icon. So you can take video without the screen on. If you setup an Activator method using a hardware activator like the volume buttons, mute switch, power button, or home button, you can capture images or video without ever waking up your iPhone or unlocking it at all. There are some things you should be aware of or even cautious of. No matter how you activate QuickShoot Pro, it does not display what you are capturing on the screen. As a result, you are capturing photos and videos blindly. At capture time, there is no way to know whether you are capturing from the front camera or the rear camera. Using the fast option via the Activator method, you can see what the current options for HDR, Flash and camera view. You can have a problem if you forget you are recording with the device screen turn off or capture too much video and run out of disk space. Video recording take up a lot of disk space, so always be aware of how much you have free before capturing video. QuickShoot Pro is a fantastic Cydia tweak that you install form Cydia. It is available in the default BigBoss repo for a cost of $0.99. Using a hacked version from another repo will result in the QuickShoot Pro not working. Watch my video on YouTube.